Sometimes you just need to let off a little steam. 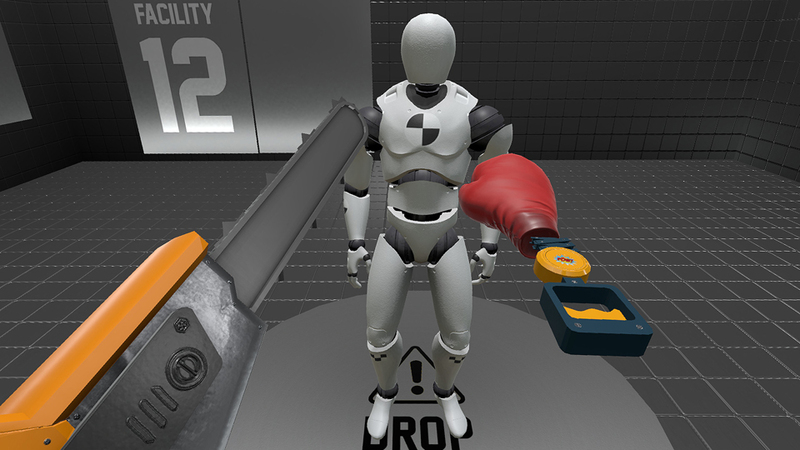 Rage Room aims to be your VR solution to that problem by placing you in a room with a series of crash test dummies that you beat upon with a wide variety of weapons. Those who have played Gorn or Drunken Bar Fight will be familiar with this premise though this aims to be a little more family friendly while still letting you unleash your violent side. Things should get crazy…they don’t. You need 2 tracked motion controllers which will be used to pick up and wield your weapons. During the campaign, you are placed in a singular room while test dummy-like robots are dropped down and a weapon spawns in the center which you must wield to defeat your foes. These weapons range from a simple bat to crossbow, bubble gun, boxing gloves, stop sign and a ton more letting play around to your hearts delight. Once you defeat that stages dummies, you press a button to launch the next series of dummies and weapons with the goal always being the same, beat them until they break. There are 2 other modes available; Challenge Mode and Free Mode with the former giving you a specific weapon set to get through a few dummies within a specific time and the latter letting you spawn any weapon you have unlocked and beat upon hapless robots. You can only click-turn and teleport with the option to include an animated teleport or instant making navigation a chore. Rage Room is just about as simple as it gets. You are in a grey panelled room with tubes mounted in the ceiling and a circle in the center of the room where your weapon will spawn. Test dummies come down from the tubes in a variety of seemingly random colors and run at you, usually armed, and try and take you out. 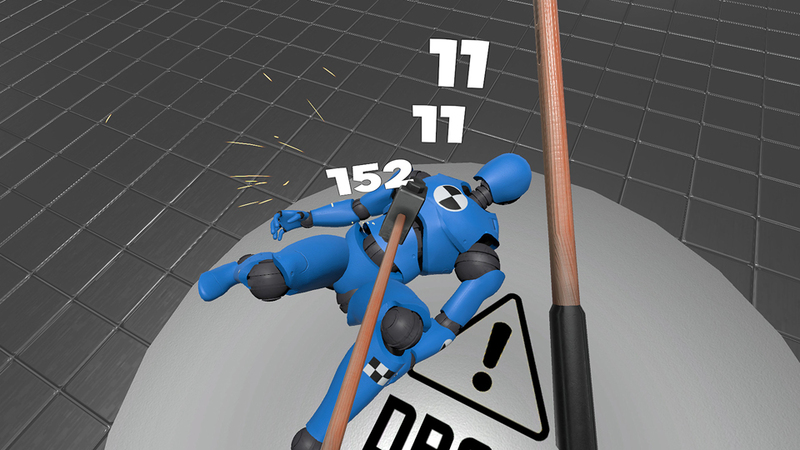 Ragdoll physics are in effect with you smashing and shooting these dummies until you deplete their health. They flail about on the ground and do there best to get up though it’s way to easy to keep them down. Some of the weapons are quite humorous and fun to use and abuse for a few seconds and the variety offered here is extensive. During the campaign a faceless female voice explains the situation in the factory you are in as these robot dummies attempt to take over and while the presentation is very small and limited, it does the job. This a bulk of the game right here. So despite the okay looking visuals, there is very little else to like about Rage Room. The campaign goes on way too long and never changes from the first stage to the last. You never leave the room and each subsequent stage plays the exact same as the last, only with a new weapon. The variety of the weapons would be fun enough save for the fact that any weapon that doesn’t involve projectiles devolves into a waggle fest. 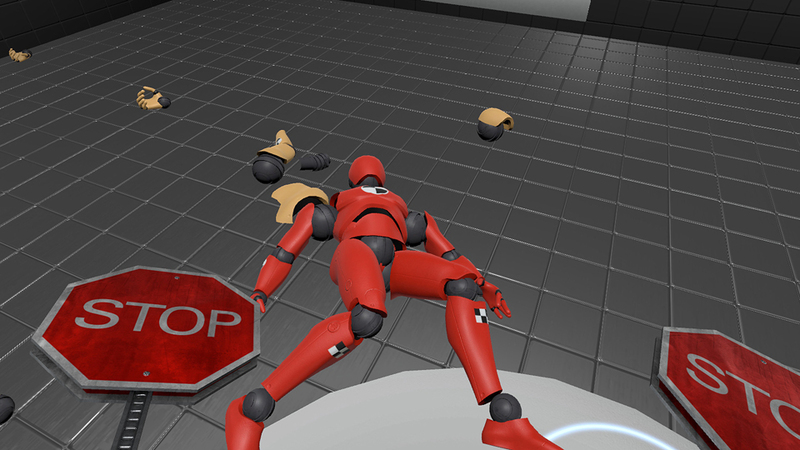 What’s worse is that the ragdoll physics only seem work when they want to or when you don’t want them too. Dummies run at you without a strategy and can be knocked down with the slightest touch or errant swing removing ANY difficulty or fun. Drones fly down to give these dummies shield and must be taken out first, but that’s only a momentary distraction before you are back to just beating on idiotic plastic. Challenge Mode is the exact same thing as the campaign, only with a timer and themed weapons and the Free Mode tasks you with killing dummies to earn money to unlock all the weapons in the game which I could not be bothered with for more than a few minutes. After playing this, I’m kind of jealous of this guy. Rage Room feels like a title that would have launched with this generation of VR and would have still been underwhelming if it had released 3 years ago. We have already seen other ragdoll fighting games take giant steps forward compared to what’s offered here and because of that, I can’t back this unless you really just want to try out a ton of weapons in VR, which this does have. What would I pay? I wouldn’t if I could go back. Rage Room is a shallow brawler with redundant gameplay and a severe lack of challenge or fun. This is $15 on Steam and a whopping $30 for the PSVR version and I think at best this is worth maybe $5, but you are seriously better off putting your money toward Drunken Bar Fight or just about any other VR brawler out there.